This came to me today and I thought it was particularly pertinent to the Women's Equality section of CPNN. The video is really good but seems to be best with MP4. The Peace Operations Training Institute (POTI) is pleased to announce the free worldwide availability of two e-learning courses through a generous grant from the Australian Government. Implementation of Security Council resolution (SCR) 1325 (2000) in Africa; and Implementation of SCR 1325 (2000) in Latin America and the Caribbean were both developed by the United Nations Entity for Gender Equality and the Empowerment of Women (UN Women) and POTI. 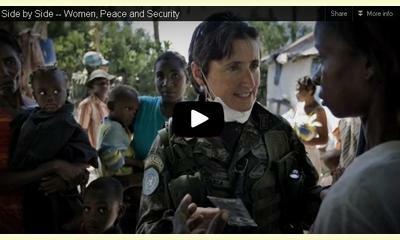 SCR 1325 (2000), unanimously adopted in October 2000, sets out a policy framework for women and peace and security. These courses introduce the main principles of the resolution and provide practical guidelines on how to implement it at the national level, including through the development of national action plans. Students who enroll in either of these courses will also be directed to view the video, Side By Side: Women, Peace and Security which was funded by the Australian Government and UN Women. The Peace Operations Training Institute is a 501(c)(3) public charity based in the United States of America. We are an independent not-for-profit organization governed by our Board of Directors. Our courses and programmes have been repeatedly welcomed by the United Nations Special Committee on Peacekeeping Operations. The Peace Operations Training Institute is dedicated to providing globally accessible and affordable distance-learning courses on peace support, humanitarian relief, and security operations to men and women working to promote peace worldwide. Students have been taking our distance-learning courses on UN peacekeeping since 1995. We have the most experience providing distance training in peacekeeping. Our alumni serve in the interest of peace all over the world. They are peacekeepers in the field at Missions, academics teaching the next generation, diplomats, high-ranking officials, and others. Thousands of students from over 170 nations have expanded their knowledge with the Peace Operations Training Institute. The self-paced, downloadable format of our courses allows the study of peacekeeping topics from anywhere in the world at any time. Our curriculum fulfils many training needs, including preparing for deployment to a peacekeeping mission, increasing effectiveness in the field, complementing study in the classroom, and increasing insight and knowledge of the UN system. This report was posted on September 7, 2012.